Did Latest Avengers: Endgame Footage Erase an Important Character? Marvel Cinematic Universe fans were treated to a new Avengers: Endgame trailer over the weekend and it looks like a character may have been cut out. The latest sneak peek at the most anticipated movie of 2019 was delivered during the beginning of the Super Bowl and featured some great new footage, but like any trailer, it poses a lot of questions. Other than the obvious ones, a few frames of footage have fans guessing that the Russo Brothers cut a character out to keep from spoiling anything. One of the scenes in question pops up at the 15-second mark in the Avengers: Endgame trailer when we see Steve Rogers, Natasha Romanoff, Bruce Banner, and James "Rhodey" Rhodes looking up at the night sky. Rogers, especially, has a shocked look on his face. When looking at the shot, there's a pretty sizable gap between Rhodey and Banner, which makes the shot look pretty weird. It doesn't fit in with standard framing techniques and MCU fans believe that someone may have been erased digitally. When looking further at the trailer, another shot shows the surviving Avengers preparing for battle, walking in a line. There is also a gap here that many are speculating could be the same character. But even more telling is the moment where Ant-Man and War Machine suit up, with their masks coming down, prepared for battle. There is a sizable gap between the two heroes, and the photography isn't particularly succinct or inline with a typical shot like this. Out of everybody, the main guess is that it's Brie Larson's Captain Marvel. 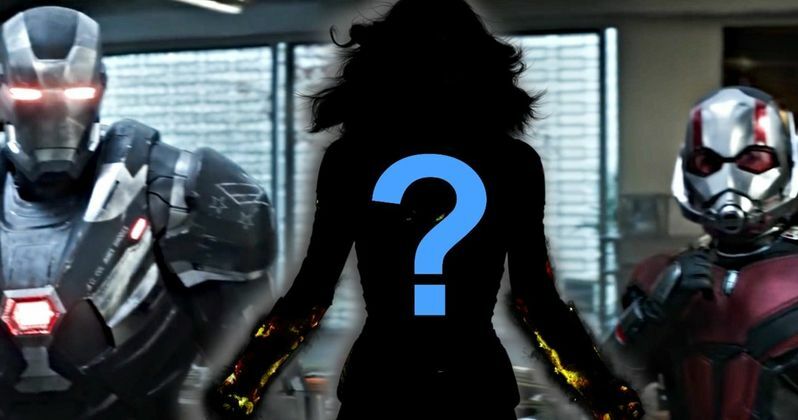 She is confirmed for the movie, but it is unclear how she will be introduced. This isn't the first time that Marvel Studios have pulled off some trickery in a trailer, with the most recent featuring Hulk fighting in Wakanda. Yes, the shots in the Endgame Super Bowl Trailer do look a little out of place and awkward, but did the Russo Brothers really digitally erase a character from the Avengers: Endgame footage? Obviously we don't know and won't know until the movie is released at the end of April. However, why would the Russos go to all of that trouble when editing a trailer together? Surely there is enough footage in the movie, which could end up being 3 hours long, that the directing duo could have chosen from not containing any spoilers. The gaps in the Avengers: Endgame trailer footage may just be what they appear to be: gaps. But, some MCU fans believe that there is something fishy going on and they're trying to figure out the mystery right now. Carol Danvers is a pretty good guess and she actually makes the most sense. However, we have yet to see any footage of the character in the upcoming movie at this time, which is more than likely due to the fact that Captain Marvel still hasn't hit theaters yet. Marvel Studios might be waiting to introduce her to the rest of the Avengers until she's been properly introduced to the MCU. You can check out some of the speculation below.